The story of the fall of Jerusalem is in 2 Kings 25:1-12 and Psalm 137 is a lament of the exiles in Babylon. After King Zedekiah of Judah rebelled, Nebuchadnezzar laid siege to Jerusalem (January 15, 588 B.C.). About 2 ½ years later, King Zedekiah and his army broke through the Jerusalem wall near the king’s garden and fled the city. Nebuchadnezzar pursued and captured Zedekiah at Riblah. Zedekiah was taken to Babylon and killed. On August 14, 586 B.C., the Babylonians set fire to the temple, royal palace, and every important building in Jerusalem. The walls of Jerusalem were broken down. Israelites that remained in Jerusalem were taken as captives into Babylon with the exception of the poorest people who were left to tend the vineyards and fields. In Babylon, Jewish captives were treated as slaves or servants (2 Chronicles 36:20). Psalm 137 remembers the Babylonian captivity and provides insight into the life of the Jerusalem captives in Babylon. The first stanza (first 3 verses) possibly indicates that the captives lived near and/or worked building canals that connected rivers around Babylon and provided irrigation for crops. The captives were so wretched that at times they could do nothing but sit and weep for their lost freedom and land. Verse 2 recorded that they hung harps, used to accompany songs to God, on willow trees. Probably the men did not technically hang their valued musical instruments on willow tree branches. More likely, they set them aside or as we say today, “put them on a back shelf,” having no heart to play or sing. To further add to the captive’s agony, their Babylonian captors demanded the Jewish play harps and sing songs of joy about Zion. The Babylonians want the captives to entertain them! Stanza 2 (verses 4-6) is about repentance. It begins by the captives asking how they can sing God’s songs in a foreign land. In the captives’ minds, songs should praise God and reverberate through the Temple and Jerusalem, not be sung for the entertainment of a heathen people. The two verses of the stanza are pledges and curses on themselves if they forget Jerusalem. Verse 5 says: may their right hand – the hand used to play the harp – lose its skill (become numb) if they forget Jerusalem. Verse 6 avers: may their tongues cling to the roof of their mouth – never sing – if they do not remember and consider Jerusalem their highest joy. Stanza 3 (verses 7-9) is a petition for God to punish the Edomites and the Babylonians. The Edomonites were off-spring of Esau who was Jacob’s (Israel) twin brother. Yet, the Edomites encouraged the Babylonians when they destroy Jerusalem. Although the Babylonians were the vehicle of God’s punishment of the Jewish people, they embraced their conquest with gleeful brutality. The brutality included taking Jewish babies from the arms of Jewish mothers and beating their heads against walls and trees. The Babylonian willow is the Salix babylonica known as the weeping willow. The tree is native to central Asia, probably China. From China it was transported along the silk route to the Middle East. The willow was planted and grew around ancient Babylon which gave its name to the species. Weeping willows favors bright sunlight. Under too much shade, the tree grows unevenly. In Israel, S. babylonica grows in Mediterranean woodlands and shrub-lands and is found in the Sharon Plain. Typically, Babylonian weeping willows grow between 30-50 feet tall. Flexible stems move gracefully in the wind. 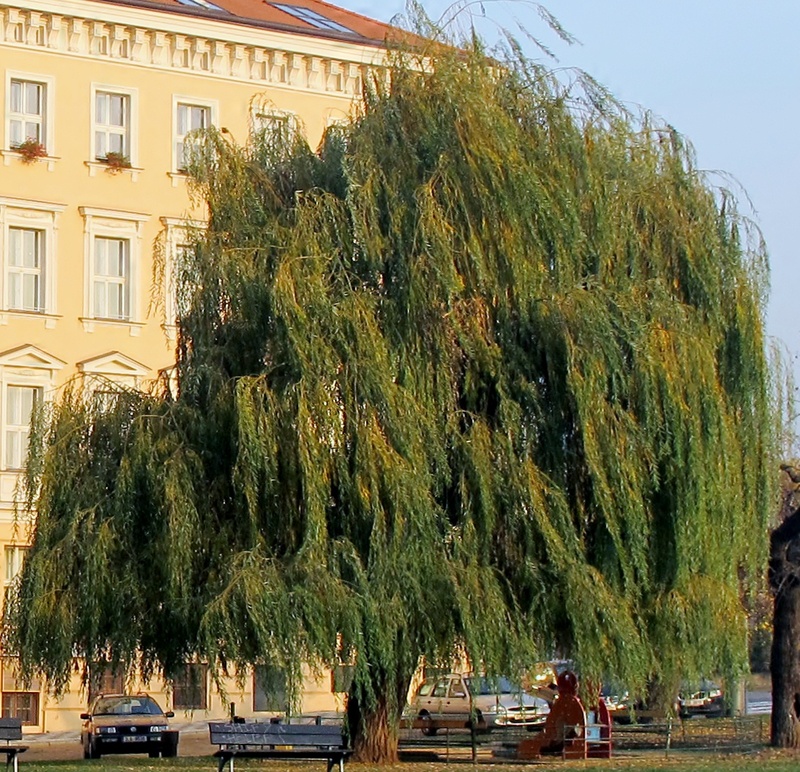 The weeping willow is deciduous and loses its leaves in the late fall and early winter months. The upper leaf surface looks olive-green while the underside appears silver. Like branches and stems, leaves hang down, or droop, as they grow. Weeping will trees produce leaves and flowers simultaneously. Depression and weeping are concepts that could be associated with the Salix babylonica because they described the behavior of the Jewish captives in Psalm 137:1-3; however, “repentance” is the better symbolism. Repentance means turning from sin and amending one’s life. Repentance implies sorrow, regret, and contrition for previous sinful behavior. The captive Jewish men repented. The result was that they could not sing God’s songs in a land of heathen idolaters. They saw moral impropriety in mixing the songs of the Lord with the things of the world. The Bible did not describe how the captivities came to repentance. They may have remembered and talked among themselves about the prophecies of Isaiah and Jeremiah. Both warned of the coming judgment on Israel, but also talked about Israel’s deliverance and restoration. Perhaps they heard directly or indirectly the consoling words of Ezekiel, who like they lived in Babylon. Ezekiel’s assured the captives that Israel would return home to Jerusalem and inhabit the towns of Judah (Ezekiel 36:8-12). Ezekiel even promised that a new Temple would be built. May I never be able to play the harp again if I forget you Jerusalem! May I never be able to sing again if I do not remember you, if I do not think of you as my greatest joy (Psalm 137:5-6). Reflection. The Jews learned the value of repentance in Babylon.Have you learned the value of repentance? This entry was posted in Plants in the Captivity & Restoration and tagged Babylon, Babylonian Captivity, Bible Garden, Bible Plants, Bible Study, God as a Gardener, harps, Jewish men, Repentence, Salix babylonica, Willow tree. Bookmark the permalink.